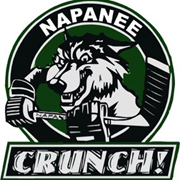 The Napanee Novice B Crunch recorded a win and a loss this week, beating the Belleville Bearcats 11-0 on Tuesday night before losing 6-0 to the Cold Creek Comets on Saturday. – The Midget B Crunch also split their two games, winning 2-1 over the Scarborough Sharks on Friday evening before dropping a 2-1 decision to the Toronto Leaside Wildcats on Saturday. – The Peewee BB Crunch played in the Peterborough Ice Kats tournament this weekend, falling just short of a trip in the championship game. Game 1 was a 1-1 tie against the Oakville Hornets. Taryn Landine scored the lone goal. Diana Wharton was amazing in net and had several highlight reel saves. Game 2 was a scoreless tie against the Oshawa Lady Generals A team. Keyra Herrington was rock solid for the shutout. The Crunch missed a couple of wide open chances and hit a cross bar late in the third period. Game 3 was a 3-0 win over the host Ice Kats. Wharton continued her solid play in goal with the shutout. The first goal was a pass out front from the corner by Kristen Sutton to Charley Weir, who buried the puck five-hole on the goalie. Charlie Weir deflected a shot by Sutton that the goalie stopped but directed a rebound right to Hailey Lay who didn’t miss to put the Crunch up by two. Landine added another goal late in the third for some extra insurance. This setup a win or tie and the Crunch would be in the championship game. They battled hard with the Carleton Place Cyclones in a great back and forth, tight checking game. With back-to-back tough penalty calls against the Crunch, the five-on-three advantage proved to be too much as the Cyclones got one past Herrington. This is all the scoring that would happen in the game, knocking the Crunch out of the tournament. – The Napanee Bantam B Crunch also took part in a tournament, travelling to Whitby for the Tournament of Heroes. In their opening game they beat the Nepean Wildcats(C), 2-1 with goals by Bethany Foster and Natalie Mills. Assists went to Morgan Boldrick (two) and Foster. In their second game they tied West Northumberland Wild, 1-1. Claire Whitney scored assisted by Huntyr Haines. In Game 3 they beat the Burlington Barracudas, 2-0. Savannah Mumby earned the shutout. Goals were scored by Brooke Hickerson and Abby Kish. Assists by Claire Whitney (two), Ainsley Hickerson and Mills. In Game 4 they lost to the Durham West Lightning, 2-1. Anna Hagerman had the lone goal, assisted by Boldrick. They closed out the tournament with a 2-1 loss to the Barracudas. Whitney had Napanee’s lone goal.